Saturday, July 9, was the day that several connected events took place in southeastern Manitoba to commemorate the 125th Anniversary of recorded Ukrainian Immigration to Canada. This year Canada celebrates one and a quarter centuries of cultural, spiritual, political and social contribution that citizens of Ukrainian heritage have made to our country. The Manitoba committee for the anniversary has organized a number of events throughout the year to celebrate the anniversary across the province. The Anniversary committee, associated with the Manitoba Provincial Council of the Ukrainian Canadian Congress, is co-chaired by community leader Joan Lewandosky and University of Manitoba professor Roman Yereniuk. Two of the events that the committee proposed were designed to coincide with two of Manitoba’s major Ukrainian cultural experiences – Canada’s National Ukrainian Festival at Dauphin and the Gardenton Ukrainian Festival at Gardenton. Both events would involve the participation of the Ukrainian Catholic and the Ukrainian Orthodox Churches. The idea was that the leadership of each of the Churches would hold a commemorative event at their respective oldest church in the region, then they would come together for a common prayer service at a third location. This is what happened at the first of the events on July 9. 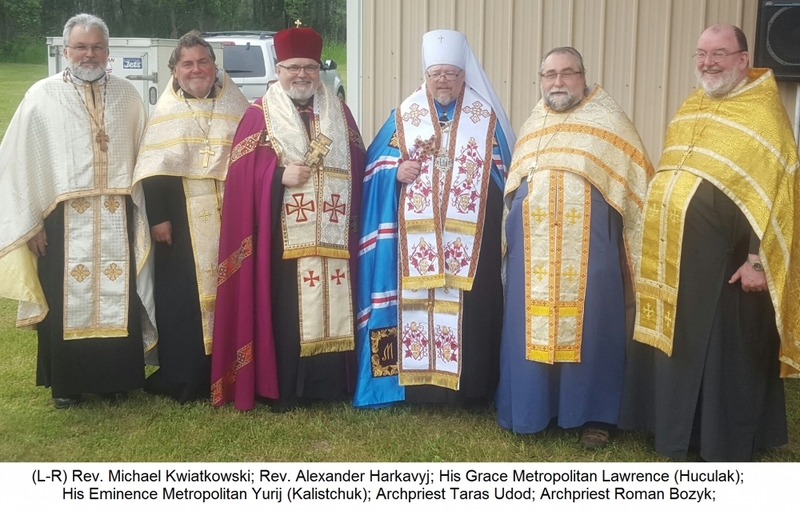 In the morning, His Eminence, Metropolitan Yurij of the Ukrainian Orthodox Church led a Panakhyda service for the deceased pioneers of the oldest Orthodox parish in southern Manitoba – St. Michael’s Historic Church, just east of Tolstoi – built in 1897. 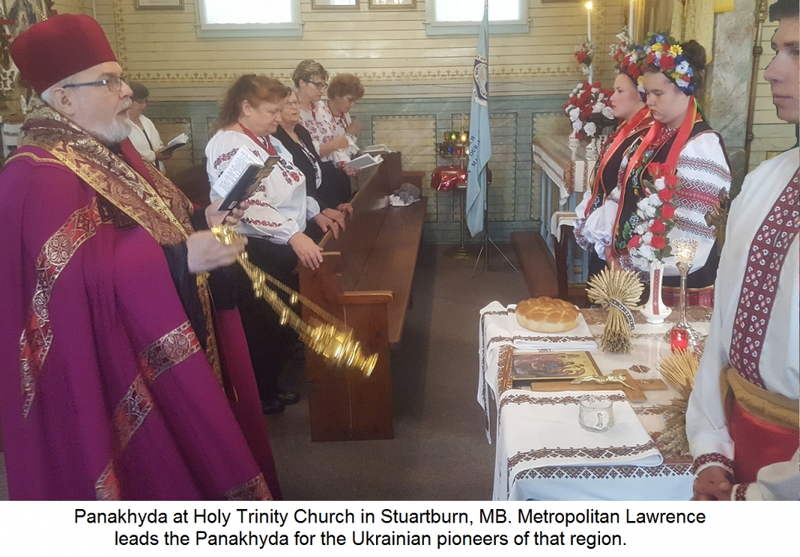 At the same time, His Grace, Metropolitan Lawrence of the Ukrainian Catholic Church was leading a Panakhyda for deceased pioneers at the Holy Trinity Ukrainian Catholic Parish church at Stuartburn, which also has a history tracing back to 1898. The parishioners and others warmly greeted Metropolitan Lawrence Huculak as he arrived at the church. Many were attired in traditional Ukrainian dress and a group of four youth met the Metropolitan at the entrance with bread and salt. Parishioner Angela Smook was the principal organizer of the event which saw the participation of a good number of people, including a representation of the Ukrainian Catholic Women’s League. Metropolitan Lawrence spoke to the gathering about the significance of the anniversary and the importance of remembering the life and times of those that came before. He explained the importance of acknowledging their indomitable faith and their great contribution to the development of our country. He invited everyone to also recognize the ongoing dedication of those now in the parish by singing a lively ‘mnohaya lita’! A caravan of vehicles then made its way from the Stuartburn church to the Gardenton Ukrainian Festival grounds. There, people were already gathering for the joint Moleben that took place at 10:30 on the grand stage of the festival. Many people arrived in shirts and blouses richly decorated with Ukrainian embroidery. When the moleben’ – with special prayers for the 125th Anniversary of Ukrainian Immigration – was to begin, the two Metropolitan-Archbishops for Canada ascended the stairs to the stage. They were accompanied by priests from the two Ukrainian Churches. Some clergy concelebrated with the Metropolitans before the altar and others participated from among the crowd of seminarians and faithful. Following the Moleben’ prayer service, everyone was invited to the main hall on the festival grounds for a banquet dinner that included, of course, varenyky (perogies) and holubtsi (cabbage rolls). Both Metropolitans read excerpts from official letters that addressed the magnitude of the 125-year celebration for all of Canada – especially Ukrainian Canadians. The next such celebration is stated to take place in Dauphin and area During the National Festival on the weekend of 29-31 July 2016. Among the highlights of this second event will be the unveiling of two monuments in honour of dedicated Ukrainian women that did much for the success of Ukrainian immigration in the early years and through the decades leading to recent times. One monument will be in honour of Pioneer Women and will be unveiled on Friday, July 29 at City Hall. The other monument will be an expression of honour and gratitude to the Sisters Servants of Mary Immaculate that served many of the communities in Western Manitoba and also established St. Paul’s Home where many pioneers lived out their years with dignity and care. This unveiling will take place in front of St. Paul’s in Dauphin on Sunday, July 31 at 10:45 AM. Besides the morning Divine Liturgies at the local Ukrainian Orthodox and Ukrainian Catholic churches, there is a joint celebration of a Moleben’ at the historic Trembowla “Cross of Freedom” site just north of the city of Dauphin.